NOW Organic Virgin Coconut Oil is a high grade, unrefined premium nutritional edible oil obtained from the first cold pressing of organic coconut (Cocos nucifera) kernels. 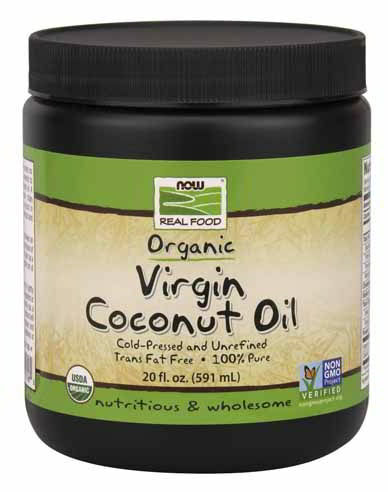 Virgin Coconut Oil is naturally trans-fatty acid free and has naturally occurring medium chain triglycerides (MCT). This oil typicallyhas the following beneficial fatty acids per serving (natural variation may occur): Lauric Acid 6.5 g, Myristic Acid 2.4 g, Caprylic Acid 1.0 g, Capric Acid 800 mg, Oleic Acid 800 mg, Oleic Acid 800 mg and Linoleic Acid 200 mg.
Take 1 tablespoon 1 to 2 times daily with meals. This Organic Virgin Coconut Oil can also be used in salad dressings, sauces, or any type of cooking as a source of essential fatty acids. Other Ingredients:Organic Virgin Coconut Oil. Storage Guidance: Store in a cool, dry and dark environment in a tightly sealed original container. After opening, product can be refrigerated or stored at cool room temperature. This product may begin to solidify at temperatures below 78°F (26°C).